Writer Peter Milligan has an interesting character in Rankorr, nee Jack Moore, the newest human inductee into the Red Lanterns. From Rankorr’s unique powers to the manner in which he recognizes throughout Red Lanterns: Death of the Red Lanterns, on behalf of the reader, some of the more nonsensical aspects of the Red Lanterns' behavior, he manages to steal most of the scenes in which he appears. The bizarre behavior that Rankorr witnesses is true to the Red Lanterns' characters, but it creates some distance for the reader. When the Lanterns, blinded as they are by rage, battle each other for no reason or take off randomly on one adventure or another, it’s hard for the reader to truly go with them, rather than be frustrated by plot points that are obvious red herrings. Death has more of a story than the previous volume, but it still contains six issues in which only two really move the Red Lantern story forward. Red Lantern Atrocitus’s monstrous creation Abysmus has poisoned the Red Lantern battery, and now the Red Lanterns are dying — one by one, and horribly. Milligan creates a good sense of genocide on the page; the reader really feels how few Red Lanterns there are and how dependent on their rings they are for survival. The carnage of a space field full of dead Red Lanterns, as depicted by Miguel Sepulveda, is truly shocking (Sepulveda’s work towards the end of this book is one of its high points). Abysmus beats Atrocitus and escapes; Atrocitus pursues Abysmus to a couple planets, finds and defeats him, and retrieves the power to cure the battery from Abymus’s body. This much of Death of the Red Lanterns is good, and if told in a couple of issues, Death might have worked out. Instead, it’s one issue for Atrocitus to fight Abysmus; a second issue for Atrocitus, Bleez, and the Red Lanterns to bicker before they go off on separate missions; a two-part Red Lanterns/Stormwatch crossover that, while entertaining, moves the plot not at all; and then two issues for Bleez to (mistakenly) fight the Star Sapphires while Atrocitus has his rematch with Abysmus. All of this, ultimately, to return the Red Lanterns just about to status quo. The Stormwatch crossover, collected also in Stormwatch: Enemies of Earth, favors that team and fits better as a one-off adventure in their book. In the first part, Apollo and Midnighter defeat the Red Lantern Skallox handily; in the second part, Atrocitus attacks Stormwatch’s Eye of the Storm base due to a misunderstanding, is also defeated, and leaves swearing vengeance (though what his actual argument with Stormwatch is, like many things in the book, is never quite clear). The encounter comes to nothing for Atrocitus, and even Skallox’s mission to Earth, a plot point simply meant to intersect him with Stormwatch, is completely forgotten. Many of the New 52 titles crossed over at this time, so Milligan can’t be blamed for the needless crossover, but indeed the two issues feel like marking time. The Bleez/Star Sapphires tangent fares only a little better. When in the second issue Bleez suddenly declares that the Star Sapphires are backing Abysmus and goes off after them, the reader is mystified — the Sapphires have never appeared in the book and Bleez has no reason to suspect them, so the fact that Atrocitus and a dozen Red Lanterns think this makes perfect sense must lessen all of them in the reader’s eyes — between the attack on Stormwatch and then the Sapphires, the Red Lanterns come off as violent, bumbling fools. The confrontation between Bleez and Star Sapphire Fatality does offer nice insights into Bleez’s character — nothing new, but touching nonetheless. But even as Milligan reveals Bleez’s unconscious reasons for seeking the Sapphires, in the end Bleez is unchanged by the encounter. The sequence is interesting, but it comes to nothing, and in that way feels like filler beside Atrocitus’s fight with Abysmus. Red Lanterns lacks a real reason for being or some sense of what the Lanterns stand for. Geoff Johns spotlighted Atrocitus a couple of times in Green Lantern and explored the conflicts inherit in violent situations and how vengeance can and cannot be justice. Red Lanterns: Blood and Rage touched on this a bit, but never in terms of the whole Red Lantern Corps’s activities day-to-day. In Death, there are a number of instances of the Red Lanterns interceding in conflicts on other worlds, but it’s always shown as the Lanterns simply wreaking mayhem on their victims, rarely with any nuance. At the end of the book, Atrocitus rallies the Red Lanterns that “the guilty await us, though they do not know it … Powered by the truth of rage, let the Red Lanterns begin.” Who “the guilty” are and how Atrocitus defines “the truth of rage” is no more clear than it has been; not is it even clear what the basis of the conflict between Atrocitus and Bleez is. Bleez separated from Atrocitus between the pages of the last book and now talks of wanting to take control of the Lanterns from Atrocitus — but for what purpose? What would Bleez do differently than Atrocitus? Much of what happens here seems to be because the story requires it and not through any strong sense of the character, and that makes it tough for the reader to be invested overall. Further, Atrocitus’s statement that “all that has happened until now … has been but preparation for the work to come” seems a disheartening acknowledgment on Milligan’s part that, twelve issues later, what we’ve seen in this title so far has mainly been prologue. From here, Red Lanterns enters non-stop crossover mode with both “Rise of the Third Army” and “Wrath of the First Lantern,” before writer Charles Soule takes over with issue #21. Though there’s two more trades of Milligan’s work coming, his independent run on this title is now essentially over. 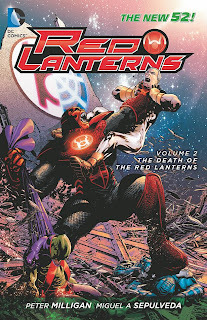 Red Lanterns: Death of the Red Lanterns and its earlier collection have been a satisfactory introduction to the Red Lanterns, but I wish more had been done with them than just introducing them and moving them around. “Let the Red Lanterns begin,” finally, indeed. Next week, the Collected Editions review of China Miéville's Dial H Vol. 1: Into You. Don't miss it! I think this collection does not offer anything new compared to the last one. The same story threads are followed and the same meaningless conflicts are reheated. But on the plus side, the monologues are dialed back a little, which helps the flow. I found it overall a little more readable, because it wasn't as sluggish as the first volume. On the minus side, Ed Benes is missing... but honestly there was not much for him on this title, so he doesn't leave a big hole. And while the Stormwatch crossover war pretty forced, the quarrel between Bleez and Fatality was not bad. Don't know what to think of Rankorr yet.